For Norwegian-Americans, Christmas Cheer Is Wrapped Up In Lefse : The Salt For many Norwegian-American families, the most anticipated Christmas treat isn't chocolate or sugar-dusted cookies. It's a simple potato-based pancake, spread with butter and sugar or jam. Megan Walhood loves the unique toasty potato flavor of lefse. "There's something so comforting about soft, starchy things," she says. For many Norwegian-American families, the biggest Christmas treat isn't foil-wrapped chocolate or sugar-dusted cookies. It's lefse, a simple flatbread. Lefse are sort of like soft tortillas, made mostly out of mashed potatoes (with a little fat and flour mixed in to form a tender dough). They're usually spread with butter and sugar, or rolled up with a bit of lingonberry jam. And families that make them make them by the dozens. "It's probably one of the first foods I fell in love with," says Megan Walhood, who lives in Portland Ore., and has family roots in Norway. "The rest of the year, I would just think about, when are we going to have lefse again?" This is part of a series of stories exploring the rich diversity of Christmastime edibles around the world, and the stories behind the food. Walhood loves the unique toasty potato flavor. And, she says, "there's something so comforting about soft, starchy things." For the Walhood family, that comfort goes way back. Megan's dad, Dale Walhood, grew up in North Dakota, with a strong sense of his Norwegian heritage — and lefse. 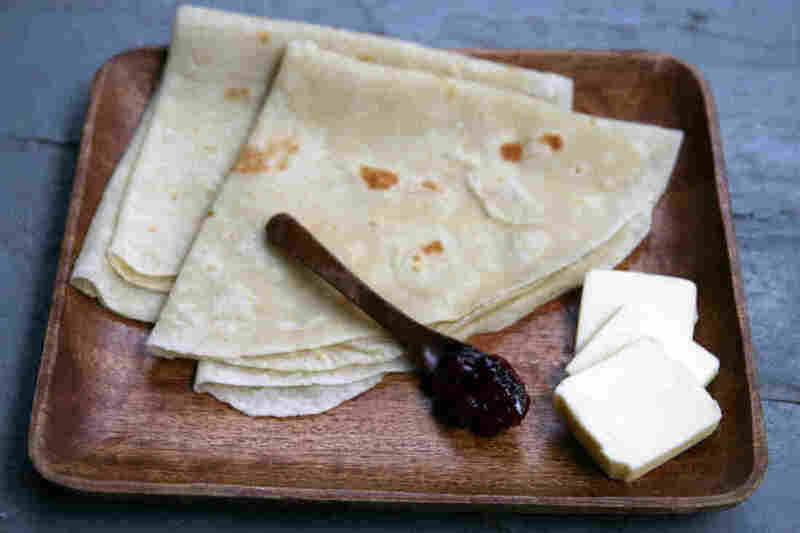 "On my father's side of the family, lefse arrived [with the family to the U.S.] in 1825, for the opening of the Erie Canal." Many of the surrounding families in their rural part of North Dakota had similar roots. And it showed in the lefse. "Weddings and funerals and christenings. Anything that smacked of a lot of Norwegians there — yeah, there'd be stacks of it," Walhood remembers. These days, lefse in America is pretty much reserved for Christmas (and, in some families, Thanksgiving). For the Walhoods, lefse-making is a true family project. Peggy Walhood, Megan's mother, has Swedish roots ("a mixed marriage," she laughs), but learned from her mother-in-law the art of wrapping up the still-warm lefse in towels to keep them soft and pliable. As with many simple foods, much of it comes down to technique. The key to lefse, the Walhoods explain, is to keep things tender. That means chilling the mashed potatoes so that you only need a minimum of flour to form a dough, and rolling them nice and thin with a special grooved rolling pin. "You want to roll it thin enough, and then also even," Megan Walhood explains. "You don't want to have a fat edge and a skinny edge, which are not the ideal. They're not approved by the 'Lefse Commission,' " she and her dad laugh. There's even an art to shimmying a long flat stick — called a lefse stick — beneath the dough to transfer it to the griddle. Then you brush off the extra flour, to keep it from either burning on the griddle or being absorbed and toughening the flatbread. It's a step that yields a nice finished product, but also a fair amount of floury mess. Dale Walhood jokes that cleanup was "about a six-hour vacuum job." Once the lefse are finished, all warm and toasty and inviting, they're spread with butter and sugar. And devoured. Carrying on the lefse tradition is especially poignant this year, the family says. Dale Walhood was diagnosed with cancer in the spring. They didn't think they'd get this Christmas together. The Walhood lefse legacy extends far beyond this particular floury table. A few years back, Megan and her husband, Jeremy, opened a business and food truck in Portland, Ore., called Viking Soul Food. The entire menu is based around Dale's lefse. "I'm incredibly proud of her," Dale says, nearly overcome. "Her sensitivity, and her dedication to quality. And I'm one of seven children, so they all look to her for their lefse." Megan and Jeremy estimate that Viking Soul Food will turn about 250 pounds of potatoes into lefse this week — enough to make memories on dozens of Christmas tables.